When you make a music video it’s important to remember that it’s a Music video and the focus for the audience will be the music. Yes there will be those who appreciate a compelling video. There will be those who prefer to see as well as hear their favourite artists. But for many, viewing a music video is just another easy way to listen to their favourite tracks. An amazing video with a mediocre track wont get a lot of traction, a hit song with a mediocre video will still get played again and again by fans. It will always be the music that is at the forefront of getting the view count ticking over. However that’s not to say a great video is not important. The video after all is designed to sell the song. But when you plan your video try not to lose focus from the music. The best videos will always compliment the music, thematically and in the edit. Never assume people will watch a video all the way through. Just look at a page on Youtube, surrounding all the videos are thumbnails designed to appeal to that particular person. There will always be other videos to tempt them away. If you don’t grab them in the opening few shots they will be gone. If you are making a performance video prepare to perform the song more times then you ever have before and each time has to be like the first. It’s easy to feel self conscious on a film set when you’re miming and pretending to play live. But that needs to be overcome very quickly. It can take 30 plus takes of a song to get a 3-minute video, and you need to give everything during each take. No matter how good everything looks, if the performance doesn’t sell the song the video wont reach anywhere near it’s potential. Any money spent on it would be wasted. As a performer you’ll have you’re own style for when you play live. You will know the moments when you were at your best during a live performance. If you can bring that to the video, half the battle is already won. Whether it’s a deep emotional connection or full-blown rock-out energy, make sure you bring it and be ready to do it on repeat. Getting story videos right is an art and takes skill. Essentially you’re trying to tell a story with no dialog and no exposition. All you’ve got is imagery and the music to connect with an audience. Some videos will act out the story in the lyrics if it lends itself to that. Most lyrics are hard to be taken too literally, so often videos will try to convey the themes and emotions of the song instead. This comes down to interpretation of the song and finding a story that can connect with the audience. It takes a good director and a good cast to do that. Even then it can go wrong. It is always best to keep the idea simple and focus on story moments that will match key moments in the song. Like any narrative piece think about what’s trying to be achieved in each scene. If it’s too complicated or not clear enough an audience will quickly lose concentration and not connect. 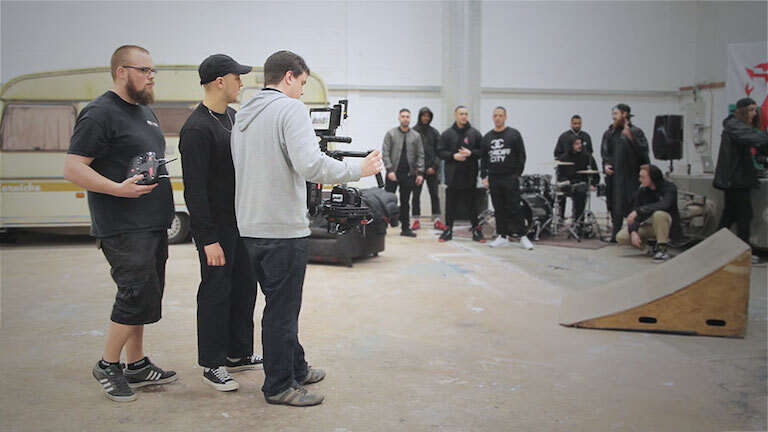 This is important in any kind of filming but with music videos a great location or locations can make all the difference. If you are performing think about what would look good around you, what kind of mood are you looking to create? If you are on a low budget a great location can act as the perfect backdrop. Think about where you have access. It can really add to the production values. When you release a video make sure you are putting it out at the right time and in the right places. It used to be all about getting it on TV but that’s now completely changed. Now the focus has shifted to online. Treat the video like you would an album. Create a buzz. Start teasing and talking about it on social media. Get photos and even a trailer out there. It’s also worth targeting music websites to premier your video. That way you will be exposed to an audience you wouldn’t normally find.